Most Americans harbour pretty dismal views of the US government, but the gulf between Republicans and Democrats is stark. Overall, 37% of American adults believe the nation is headed in the right direction, according to a new poll from Business Insider’s partner MSN. A plurality says their pride in being American decreased over the past year, and almost a third say the government isn’t working at all. The survey found notable differences between Republicans and Democrats, residents in red and blue states, and women and men. While 71% of Republican respondents said they thought the country was going in the right direction, just 5% of Democrats agreed. 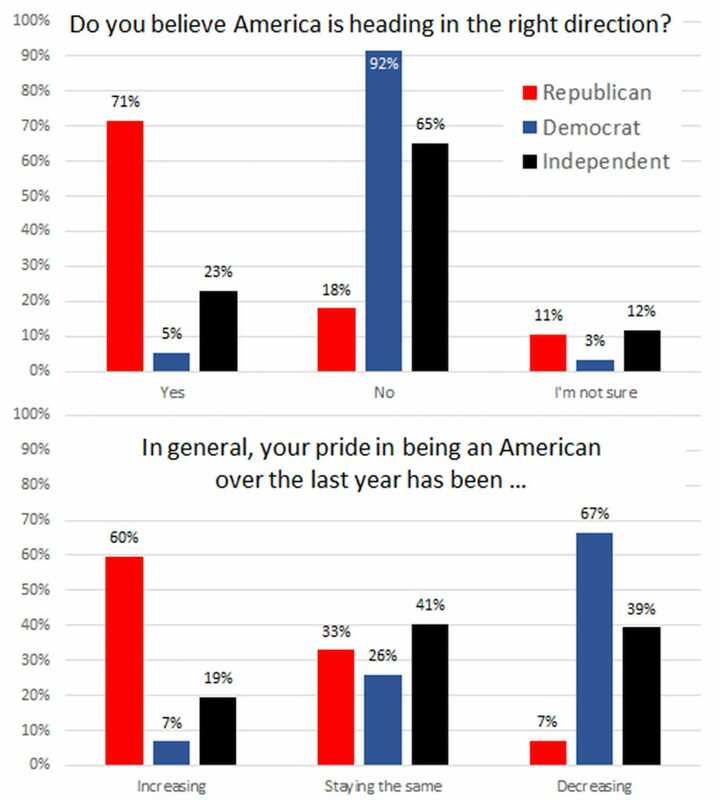 Sixty per cent of Republicans said their pride in being American increased over the past year, while just 7% of Democrats said so. While 23% of Republicans believe the country is either working great or pretty well, just 5% of Democrats fell into those two categories — 43% of Democrats said the government didn’t work at all. Notably, independent respondents aligned more closely with Democratic voters than with GOP voters. Just 23% believe the country is on the right track, and 19% say their pride in being American increased over the past year. Voters in North Dakota and Alabama have the most positive views of the US, with 78% of each state’s residents reporting that they are “very proud” to be American. Just 35% of residents in Washington, DC, and Hawaii said they were very proud. In an April Gallup poll, 67% of Democrats said they were “extremely” or “very” proud to be American, an 11-point drop from the previous year. The MSN poll found that 32% of Democrats were “very” proud and 24% were “somewhat” proud, marking an even larger drop. In general, polling has for years found that fewer than half of Americans believe the country is moving in the right direction. MSN polls its readers, then uses machine learning and big data, such as the census, to model how a representative sample of the US would have responded. It’s nearly as accurate as a traditional, scientific survey, MSN says. The MSN poll surveyed 441,509 readers on July 3 to generate this data.